Luxembourg City is the safest town in the world, according to a 2016 report by the consultants Mercer. The Grand Duchy is one of the ten most attractive countries for foreign residents, said the Expat Insider survey conducted in the same year. The country also has the highest concentration of Unesco World Heritage Sites. This is also a multicultural place, with around 170 nationalities living in the capital, representing more than two-thirds of the population. For hundreds of years, this fortress town was prized by Europe’s empire builders, and this has left a rich architectural heritage. This experience also helped form a national outlook that understands how to build peace between people from around the world, regardless of religion, culture, or ethnicity. The destruction of Luxembourg’s once-mighty fortress was decreed in May 1867 by the Treaty of London. This international agreement also guaranteed the country’s neutrality. Once known as the “Gibraltar of the North” due to it having some of the most extensive fortifications in Europe, it is now a spectacular place to explore. For example, the Corniche is a known as “the most beautiful balcony in the world”, overlooking the quaint lower-town or wonderful parcs with remaints of the old fortress. Then there are the “casemates”, 17km (10.5miles) preserved of initially 23 km (14,28 miles) of fascinating military tunnels dug into the rock under the city. Little wonder that Unesco has listed the old town as one of its World Heritage Sites. The social and psychological legacy of history also has modern-day benefits. Foreign soldiers and the local population shared this city for hundreds of years. This experience of different cultures living and working together has formed a country at ease in a globalised world. 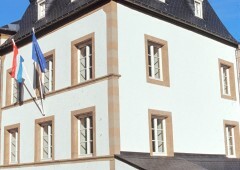 Luxembourg’s schools have taught in French and German since 1083, complementing the native Luxembourgish language. These days, English is also taught early in secondary school. This linguistic ability matches the country’s cultural openness. Political neutrality in 1867 made it a destination for those fleeing persecution, including refugees from neighbouring Lorraine and Alsace after their annexation by the German Empire in the 19th century. Luxembourg was also a haven for artists seeking freedom of expression, including the great French writer Victor Hugo. Religious orders and Jews also found sanctuary here. Luxembourg is the birthplace of Robert Schuman, one of the founders of the European Union, the organisation that has done so much to cement peace on this continent. Cross-border business also has a long history. The industrialist Emile Mayrisch played a central role encouraging cooperation between steel companies based in Luxembourg, France, Germany, and Belgium. 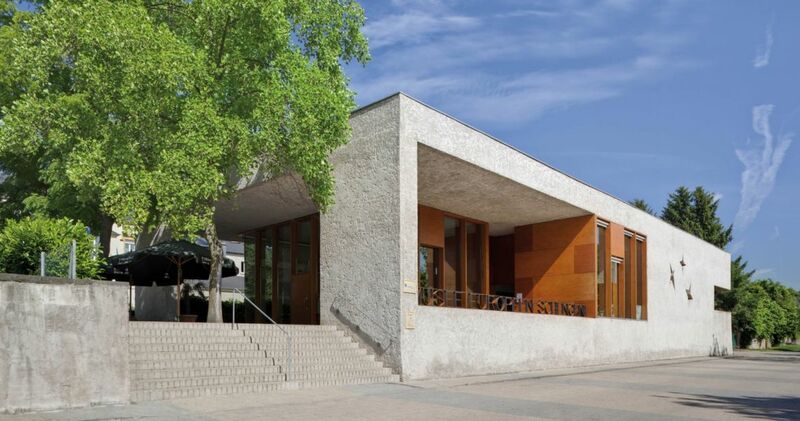 The National Resistance Museum in Esch-sur-Alzette and the National Military History Museum in Diekirch seek to describe the hardships faced by Luxembourgers during the Second World War. This legacy of suffering goes a long way to explain why Luxembourg did all it could to facilitate Franco-German reconciliation after 1945. 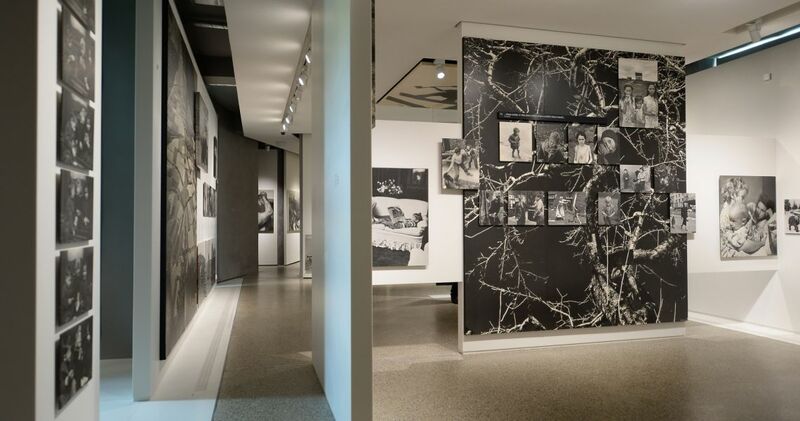 It was in this spirit that Luxembourg-born American Edward Steichen, the director of photography at New York's Museum of Modern Art, chose this country as the permanent home for his Family of Man photographic exhibition. By expressing our common humanity, this collection (in Clervaux Castle) is a compelling appeal for world peace. It is listed on Unesco’s Memory of the World register. 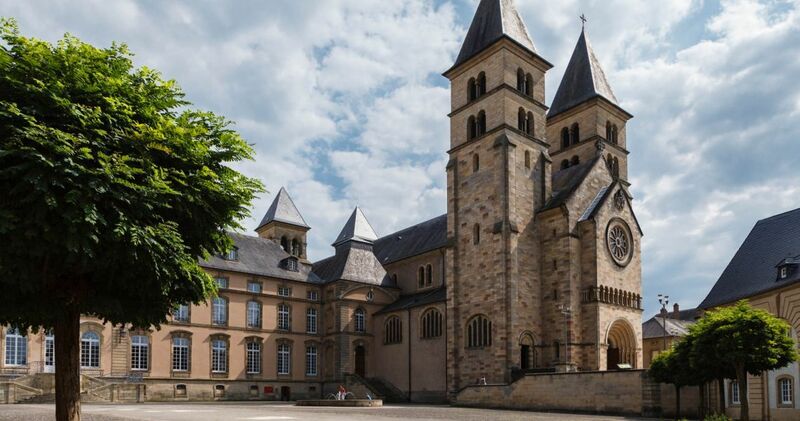 Echternach basilica became the symbol of Luxembourg’s post war reconstruction. This pilgrimage site was destroyed during the war, but has now been reconstructed. Each Whit Tuesday it hosts the the Dancing Procession, an historic tradition which is recognised as Intangible Cultural Heritage by Unesco. 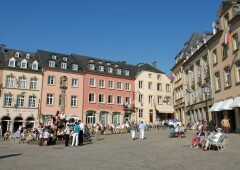 Luxembourg has contributed, as a founding member, and as an EU capital. The European Coal and Steel Community was founded in 1951 with its headquarters in Luxembourg. This was the first step on the way to the creation of the EU we know today, with many of its institutions now based in this country. The Grand Duchy is also the birthplace of the EU’s borderless “Schengen area”, named after the village near the French and German borders where the agreement was signed. While this agreement abolished internal customs posts (currently between 26 countries), it led to reinforced protection of external borders. Not only is Schengen the meeting point of the Benelux, Germany and France, but it is on the Moselle river, an historic transport route. 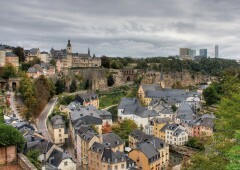 On Saturday morning explore the ancient city-fortress of Luxembourg City, one of the European Union’s capitals. Then in the afternoon, drive down the Moselle river to Schengen, the village in Luxembourg’s wine region that is now synonymous with a borderless Europe. A guide from the Luxembourg City Tourist Office will show you around the city where one of the EU’s founding fathers, Robert Schuman, was born. You will then be brought to the point on the Moselle river where Luxembourg, Germany and France meet at Schengen, featuring a visit to the European Museum located there. As well as the stunning views of this “tri-point”, you will also have a chance to enjoy “Europe without borders”. Taste the high quality wines produced along the river. Circular walk "City Promenade Luxembourg"
Colpach park is a hidden gem. 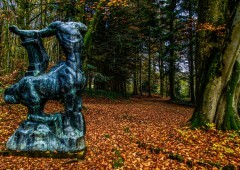 Developed for the Luxembourgish steel entrepreneur Emile Mayrisch in 1916, it boasts several sculptures by early 20th century artists including Maillol, Despiau, Bourdelle and Kolbe. 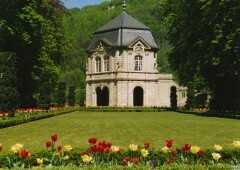 Colpach Castle, which also belonged to Mayrisch, became the centre of an artistic, scientific and political circle which included the likes of André Gide, Annette Kolb, Karl Jaspers, Jacques Rivière, Jean Schlumberger, Ernst Robert Curtius, Marie Delcourt, Richard Coudenhove-Kalergi, and Walter Rathenau. They all shared the same beliefs about the need to temper nationalism and boost mutual understanding. The castle is now a retirement home and cannot be visited. On 26th December 1944, just before they were driven from the country, German troops purposely destroyed most of this historic basilica. In the post-war reconstruction, the Roman origins of the church were brought to the fore by the architects Hubert Schumacher and Michel Heintz, paying particular attention to restoration of the ceiling. 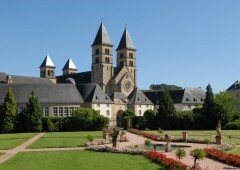 The new front facade and its towers is inspired by the church in Paray-le-Monial in France (where the then bishop of Luxembourg Léon Lommel had been exiled). The restoration work was finally completed in 1953, making it a powerful symbol of reconstruction and popular unity. 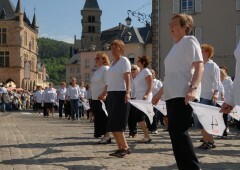 This is also the location for the Dancing Procession which takes place every Whit Tuesday. This ancient religious tradition attracts hundreds of priors and spectators, and is recognised as Intangible Cultural Heritage by Unesco. Find out more at the Centre de Documentation records office. This visit takes in the church of St Peter and Paul and the ex-convent of St Claire. Our route crosses “Sauergaass” one of the town’s oldest roads, before moving towards the remnants of the town’s protective walls. The guide will then take the group towards the Gothic house, the market square, the abbey courtyard, and the municipal park. The memory local boat builders (known as Schaffbaier) is also included in this visit. The historic way-marked circular walk on the Hoesdorf plateau, goes from Bettendorf to Reisdorf, including a part of the defensive “Westwall” near to Wallendorf (D). This path brings to mind the tragic events that took place here during the winter of 1944/45. On this 17km (10.6 miles) route, there are 17 information panels to guide visitors. Between Bettel and Vianden one can see anti-tank defences. Vianden was the last Luxembourgish town liberated, on 12th February 1945. Between 1862 and 1865 the great French writer and author of Les Misérables , Victor Hugo spent time as a tourist in the Grand Duchy. He returned in 1871 as a political refugee. His memory has been kept alive in this country, and in Vianden in particular where his old house has been a museum since 1935. During the summer, the museum is open every day except Monday and during certain holiday periods from 12.00 to 18.00. From 31st October 2017 until Easter it is open from 11.00 to 17.00. Boundary marker with Germany that recalls the memory of the first allied soldiers to pass this way, 96 days after the Normandy landings on 11th September 1944 at 16.30 hours. Patton Square is named in honour of General George S. Patton Jr., the commander of the 3rd American Army that liberated Ettelbruck on 25th December 1944. 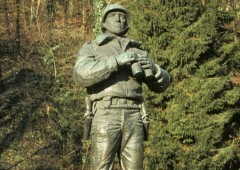 There is also a Patton monument by the bridge over the Sûre river. Officially unveiled 1954, May 16th the sculpture features a sword thrust into the ground as a symbol of peace, with an American bald eagle keeping watch. This work was created by two Luxembourgish artists: Pierre Droessart (sketches) and Aurelio Sabbatini (sculpture). In 1970 a bronze statue of General Patton with a M4-41 Sherman tank was added. This is an exact copy of a piece by Earle Freaser which is housed in the West Point Military Academy in the US. This museum pays tribute to General George S. Patton Jr., the commander of the 3rd American Army that liberated Ettelbruck on 25th December 1944. It describes the key events from the Second World War in Luxembourg. General Patton’s heroic personality is a the heart of the exhibition. Through numerous photographs, documents, and original objects, the museum illustrates the German invasion in May 1940, the occupation, the liberation by American troops in September 1944, and the post-war years. 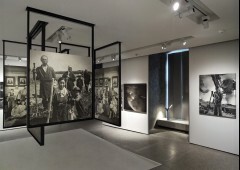 The Family of Man photographic exhibition is listed on Unesco’s Memory of the World register. It features 503 photos taken by 273 artists from 68 countries. The theme is humanity as a family, inhabiting the same space, sharing the same pleasures and pain. Conceived during the Cold War, it is an appeal for world peace. It was assembled by the Luxembourg-born American Edward Steichen when he was director of photography at New York's Museum of Modern Art. Guided tours in July, August and September. Clervaux during the Battle of the Bulge. You will be guided by a member of CEBA (Battle of the Ardennes Study Circle) who will explain the details and context of the battle. The Battle of the Bulge, fought during the winter of 1944/45, was the last desperate attempt by the Third Reich to break through the allied advance in the west. The attack through the Ardennes lasted around two months, and was one of the biggest battles of the Second World War. When this attack had been repulsed, the whole of Luxembourg was finally liberated from German occupation for the second time. Reservation possible up to midday on the day. 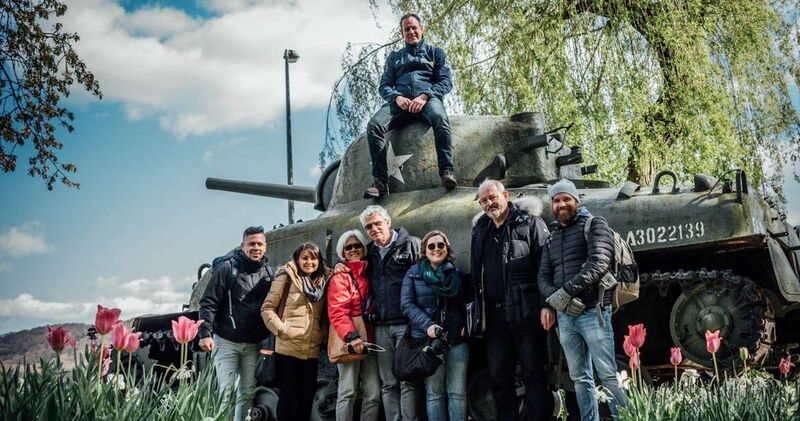 The Battle of the Bulge Museum in Clervaux Castle brings to life this major Second World War confrontation, using original documents, uniforms, and weapons. Because it is located in the heart of the Luxembourg Ardennes forest where the battle took place, Clervaux suffered extensive damage in the fighting. The Battle of the Bulge, fought during the winter of 1944/45, was the last desperate attempt by the Third Reich to break through the allied advance in the west. The attack was a huge failure, and Luxembourg was once again liberated. The details of this major struggle, fought in tough winter conditions is described by the museum. Life-size models are on four floors, dealing with local history. The curators have been careful to ensure that the new concept will be coordinated with other museums featuring Battle of the Bulge exhibits. The museum is currently being renovated, but remains open. 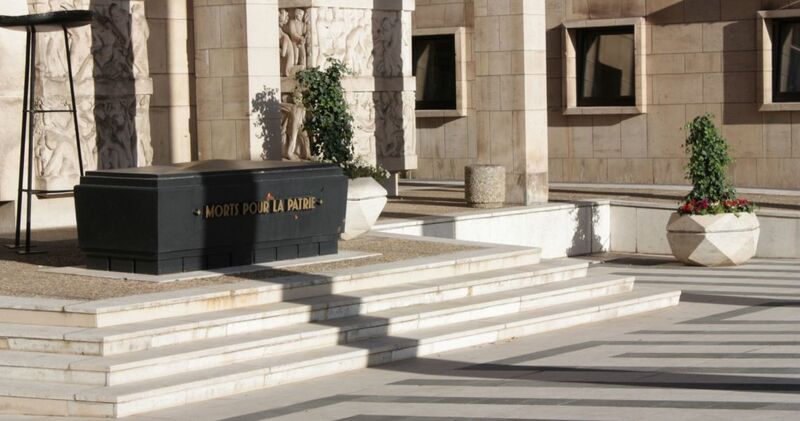 This museum tells the story of Luxembourg under Nazi occupation from 1940 to 1945. Photographs, objects, and works of art detail how people were affected and reacted. Particular attention is paid to the Luxembourgish underground-resistance movement, strikes, the avoidance of forced conscription in the German army, and other acts of active and passive opposition. 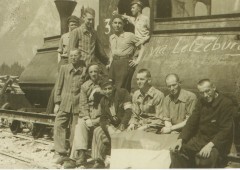 The nature of Nazi oppression is described, particularly the treatment and deportation of Luxembourg’s Jewish population. There are also regular temporary exhibitions, addressing themes such as the pre-war period, the many ways human rights were violated under the Nazis, and the education system. Groups can book visits at any time from 08.00 any day of the week. Free of charge. The European Centre features the Schengen European Museum and the Europe Direct information centre. As well as explaining the Schengen Agreements that abolished the EU’s internal borders, the centre gives insight of EU policy. European citizens, their family members, and holders of a single European visa have the Schengen agreement to thank for free movement across the continent’s borders. The first agreement was signed by five countries on 14th June 1985. 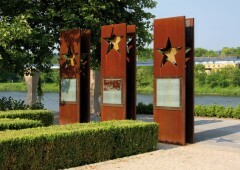 They chose this symbolic location as the meeting point on the Moselle river of Luxembourg (and thus its Benelux partners Belgium and the Netherlands), France and Germany. This was the first step that eventually led to the institutionalisation of the Schengen Area by the EU’s Amsterdam Treaty signed on 2nd October 1997. These rules were strengthened in the Lisbon Treaty of 13th December 2007, creating “an area of freedom, security and justice”, with an impact on policing and legal activity, as well as creating joint policies on visas, asylum and immigration. There are currently 26 member states of the Schengen Area, including countries not in the EU. Thus foreign citizens with a visa or resident permit from one member state can move freely within that zone. Opening hours: November-March: Mon-Sun 10.00 to 17.00 | April-October: Mon-Sun 10.00 to 18.00. Closed: 1st Nov | 24 Dec – 1st Jan.